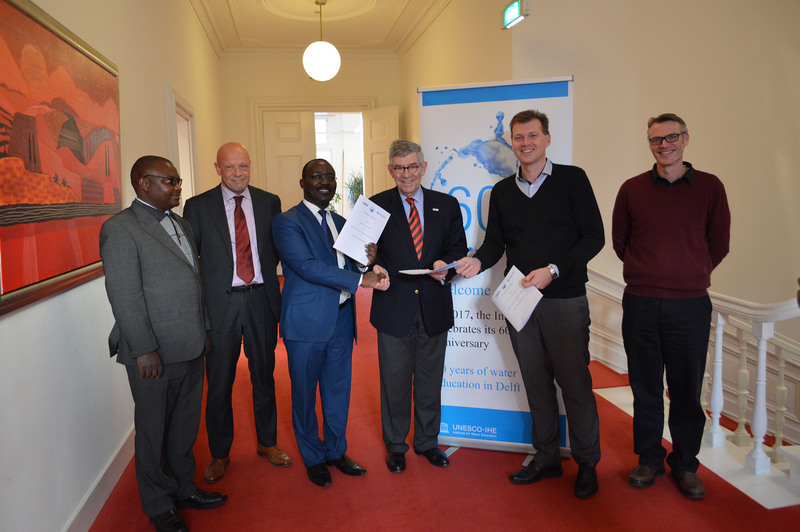 On January 16th the Managing Director of the National Water and Sewerage Corporation (NWSC), Dr. Silver Mugisha, The CEO of Vitens Evides International (VEI), Dr. Marco Schouten, and the Rector of UNESCO-IHE, Dr. Fritz Holzwarth, signed a tri-partite Cooperation Agreement to further strengthen the collaboration between the three organizations. The three parties of this cooperation agreement are quite diverse. NWSC is Uganda’s national water utility mandated to operate and provide water and sewerage services in 174 towns in the country. It has been globally recognized as a utilitywhich has been able to achieve remarkable performance improvements over the past two decades. VEI is the vehicle for the international corporate social responsibility agenda of six Dutch water operators: Vitens, Evides, Watercompany Limburg, Watercompany Groningen, PWN Watercompany North-Holland and Brabant Water. VEI supports peer water operators on a not-for-profit basis towards realizing SDG 6 (ensuring universal access to water and sanitation). UNESCO-IHE is the largest graduate water education facility in the world, with a long history of capacity development for water supply and sanitation in Africa. Although these organizations are quite different from each other and have different approaches and expertise, they share a common mission: to improve the capacity of water utilities to provide water supply and sanitation services to all. Moreover, this diversity allows the partnership to combine more operational and practical utility management know-how with capacity development and applied research expertise. This makes this partnership highly relevant for addressing the challenges existing in the African water supply and sanitation sector. Cooperation will, amongst other things, focus on undertaking joint capacity development programmes and joint applied research on relevant topics related to water utility management. An important element of the cooperation agreement is to strengthen the International Resource Center of NWSC, which provides training to staff of NWSC and from other water utilities. By strengthening IREC, it will be able to become a regional training and knowledge centre catering to staff of water utilities in (Eastern) Africa. A strong regional training centre, supported by VEI and UNESCO-IHE, will allow for much more effective and efficient capacity development for African water utilities.